Strange Days: Flying triangle on Google Earth? Flying triangle on Google Earth? What do you make of this? Had this image simply appeared on the Internet, with no grid reference, I would have passed it off as a hoax. However, someone posted the precise location on the Paracast forums, so I opened up Google Earth and took a look. I was expecting some vague, amorphous blob. But look at it. Click the image to see a larger version. 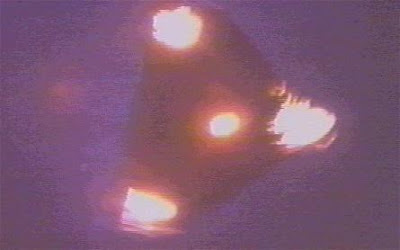 This looks for all the world like an image of a flying triangle, such as the type photographed in Belgium in 1989-90. I don't normally steal other people's images, but this image has appeared in so many books, magazines and websites, I dare say no-one will be pursuing me for breach of copyright. This image, of one of the 1989-90 Belgian FTs is generally regarded to be an authentic photograph of something, although no-one is exactly sure what. What do you think? 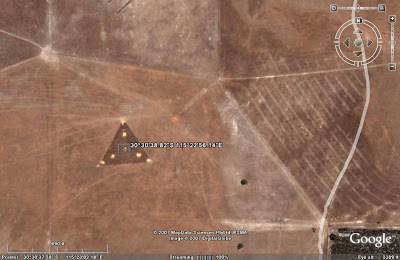 Has a black triangle been captured by Google Earth? Could it be some kind of helipad? The roof of a triangular building? An oil rig? Even if it is a craft of some kind, it doesn't mean it's from anywhere other than Earth. I think this anomaly was photographed somewhere over Australia. Flying triangles have been seen all over the globe since the mid-late 1980's, often moving silently at low altitude, before shooting away at great speed. The Belgian airforce sent aircraft to intercept FTs on a number of occasions during 1989-90. Crews reported incidents of radar jamming whenever they locked on to the craft. When they tried to approach the FTs, the mystery craft would often accelerate to speeds in excess of 1800 km per hour, leaving the Belgian pilots far behind. Here's some footage the Belgian airforce shot of one of the craft pursued. Does anyone know of any other possible UFOs caught on Google Earth? If so, please let me know. Though I may not mention it on my blog, I am a big believer of life other then here. I have seen my share of strange things while living in Pennsylvania. My ex was in the military and even he told me that we do not have such technology. Perhaps someday I will discuss more on my Astral Travel blog. This is pretty good stuff you have posted. At this time I am becoming more and more intrigued with 2012. It is all quite exciting. The 79.2 MW Emu Downs Wind Farm ( [show location on an interactive map] 30°30′S, 115°20′E) is a joint development between Stanwell Corporation and Griffin Energy and construction of the $180 million project commenced in November 2005. The site is approximately 200 kilometres north of Perth, near Cervantes and the project was commissioned in October 2006. Thanks for your kind words, Titania. I've experienced a few strange things, too, hence my interest in other-worldly happenings, I guess. Thanks for the info re: the wind farm, Anonymous - it's very much appreciated. Shame it's not a flying triangle! But it's good to have a solution to the mystery.